Eastern Mennonite University has been honored as a winner of the National Wildlife Federation’s annual competition “Chill Out: Climate Action on Campus.” This award program recognizes U.S. schools that are designing and implementing creative approaches to advance sustainability on campuses. EMU is one of six winning schools that were chosen from a national pool of entries. 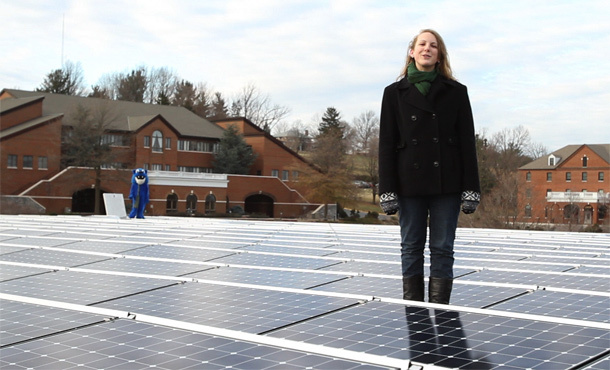 EMU’s winning entry gives an overview of sustainability efforts at EMU and highlights the installation of a solar array on Hartzler Library roof in fall 2010. The two-minute video was produced by EMU’s marketing and communications media specialists Lindsey Kolb and Jon Styer, both graduates of EMU’s Visual and Communication Arts program. Among the university’s sustainability efforts highlighted in the video are a bicycle cooperative, integration of sustainability across the entire curriculum, dining hall composting that is used in the campus garden to grow produce for the dining hall, a residence hall built to Leadership in Energy and Environmental Design (LEED) certification standards and more. The video prominently features EMU’s solar power array installation, the largest solar deployment in the state of the Virginia to date. The solar array has the capacity to generate 104.3 kilowatts of clean energy from 328 high efficiency photovoltaic solar panels installed on the library roof. Within the first six weeks of operation it offset emissions of more than 8,700 pounds of carbon and also reduced EMU’s energy consumption and peak demand from the grid. In its 35-year lifetime the array is expected to offset over 6,000 tons of carbon. Live data about energy generated by the solar array can be viewed at www.emu.edu/solar. EMU anticipates installing a second even larger array adjacent to the University Commons in the coming months. Other winning schools in the competition include: Central Carolina Community College, Pittsboro, N.C.; Baylor University, Waco, Tex. ; Manhattan Comprehensive Night and Day High School; Missouri University of Science & Technology, Rolla, Mo. ; and Montreat (NC) College. The efforts of the six winners will be broadcast in NWF’s Chill Out: Climate Action on Campus webcast on April 13 . The colleges will also receive a monetary award from the National Wildlife Federation to continue exploring innovative clean energy and climate action initiatives. This year’s webcast will be co-hosted by Tara Platt, voice and live-action actress, and Yuri Lowenthal, voice of Superman on CW’s Legion of Superheroes. The free program will celebrate this year’s award winners and showcase initiatives occurring on campuses across the nation. The webcast will be available for viewing on-demand after April 13. Campus leaders all across the country are encouraged to host events on their campuses and in their wider communities to watch the webcast. The program will be part of a series of events scheduled on hundreds of campuses across the country, building excitement in the week leading up to Earth Day 2011 (Apr. 22). Visit www.campuschillout.org for details on hosting a live screening party and to view the webcast. “Chill Out: Climate Action on Campus” is supported by The Kendeda Fund and other partners including Climate Counts, AASHE, Energy Action Coalition, Jobs for the Future, Campus Conservation Nationals, Earth Day Network and more. That is awesome! I’m so proud of EMU. Nice work, EMU. This makes me happy! Hey Eric….cool to see you on this site! I always knew we had things in common. I am glad to see that you’re encouraging something so positive in this world! Wow! Impressive…..does EMU use disposable dishes in their cafeteria?